August 2004, an alert Maryland Transportation Authority Police officer observed a woman wearing traditional Islamic garb videotaping the support structures of the Chesapeake Bay Bridge, and conducted a traffic stop. The driver was Ismail Elbarasse and detained on an outstanding material witness warrant issued in Chicago in connection with fundraising for Hamas. In the basement of his home in Annandale, VA, a hidden sub-basement was found, containing 80 banker boxes of the archives of the Muslim Brotherhood in North America. One of the most important of these documents was the Muslim Brotherhood’s strategic plan for the United States and was entitled, “An Explanatory Memorandum On The General Strategic Goal For The Group In North America” (English version or Arabic version), written in May 1991 primarily by Mohamed Akram, a former director of the United Association of Studies and Research (UASR), a Hamas front that was based in Northern Virginia from 1991 to 2004. UASR, an unindicted co-conspirator in the 2008 Holy Land Foundation terrorist finance trial case that this document was entered into evidence, was headed by Ahmed Yousef who now serves as political advisor to head of Hamas in Gaza, Ismail Haniya. Muslim Brotherhood’s plan and Obama’s connection exposed. An Explanatory Memorandum explains that the Muslim Brotherhood-organized “Islamic Movement” in the US is a “settlement process” to establish itself in the United States and, once entrenched, to undertake a “grand jihad” characterized as a “civilization jihadist” mission under Muslim Brotherhood direction. The Muslim Brotherhood is relying on non-Muslims in America to aid it, usually inadvertently, to destroy America from within. In the introductory letter, Akram referenced a “long-term plan, approved and adopted” by the Shura Council in 1987 and proposed this memo as a supplement to that plan and requested that the memo be added to the agenda for an upcoming Council meeting. Appended to the document is a list of all Muslim Brotherhood organizations in North America as of 1991. Muslim Brotherhood’s web of terror, Part 2: Civilization Jihad aka Stealth Jihad. Appearance can be deceiving. Nefarious Civilization Jihadists wear suits & ties, not kufi cap nor thobe. Wolf under sheep’s clothing. For example, CAIR & Muslim Brotherhood terrorists. The page numbers noted below correspond to the page numbers in the center of the bottom of each page in the document. Enablement of Islam in North America, meaning: establishing an effective and stable Islamic Movement led by the Muslim Brotherhood which adopts Muslims’ causes domestically and globally, and which works to expand the observant Muslim base, aims at unifying and directing Muslims’ efforts, presents Islam as a civilization alternative, and supports the global Islamic state, wherever it is. In order for Islam and its Movement to become “a part of the homeland” in which it lives, “stable” in its land, “rooted” in the spirits and minds of its people, “enabled” in the live [sic] of its society and has firmly-established “organizations” on which the Islamic structure is built and with which the testimony of civilization is achieved, the Movement must plan and struggle to obtain “the keys” and the tools of this process in carry out this grand mission as a “Civilization Jihadist” responsibility which lies on the shoulders of Muslims and – on top of them – the Muslim Brotherhood in this country. “The process of settlement is a ‘Civilization-Jihadist Process’ with all the word means. The Ikhwan [Muslim Brotherhood] must understand that their work in America is a kind of grand jihad in eliminating and destroying the Western civilization from within and ‘sabotaging’ its miserable house by their hands and the hands of the believers so that it is eliminated and God’s religion is made victorious over all other religions. Without this level of understanding, we are not up to this challenge and have not prepared ourselves for Jihad yet. It is a Muslim’s destiny to perform Jihad and work wherever he is and wherever he lands until the final hour comes, and there is no escape from that destiny except for those who chose to slack. But, would the slackers and the Mujahedeen be equal. But the more dangerous long-term threat is what the Muslim Brotherhood calls “civilization jihad” phase, which is considered an integral, even dominant element of jihad, precedes “violent jihad” phase. Civilization jihad is a form of political and psychological warfare that includes multi-layered cultural subversion, the co-opting and recruiting of senior leaders, influence operations, propaganda and other means of insinuating shariah gradually into Western societies. The violence is always implicit in the overall strategy, albeit held in reserve for the final stages of the offensive. It is the combined effect of the violent and pre-violent strains of jihad that constitutes the most serious threat to America and its free people. The Elbarasse’s trove of Muslim Brotherhood’s documents shows that the goal of destroying Western Civilization from within is to be achieved with a “phased plan” that divide the conquest of the non-Muslim world into either 5 or 7 phases. The plan is a stepped process modeled directly after Sayiid Qutb’s Milestones and the shariah doctrine of progressive revelation. One such document is an undated paper entitled, “Phases of The World Underground Movement Plan.” It specifies the 5 phases of the Muslim Brotherhood Movement in North America and offers a chilling operational insight into the mindset, planning, and vision of the Islamic movement in North America. How Islam is destroying Europe. • Demanding that shariah replace Western law. Note that many of the foregoing techniques entail, in one way or another, influencing and neutralizing the American government at all levels. Dawa, the call to Islam that by Islamic law must precede jihad, is all-too-often dismissed, as are its manifestations under the rubric of non-violent jihad, simply because this kind of assault does not kill. Instead, it intends “merely” to subjugate. Absent an appreciation of the threat posed by stealth jihad, the pre-violent civilization jihadist is free to proceed unimpeded under the radar in Western societies, infiltrating and subverting along lines specifically tailored to today’s liberal, multicultural-minded non-Muslim populations. It does so in ways that are genuinely difficult to recognize, oppose or counter. The objective of civilization jihad, also known as stealth jihad, is the same as the violent form of jihad: subjugation of Dar al-Harb (the “House of War,” or the non-Muslim world) to Shariah, which would result in the non-Muslim population of being controlled by Dar al-Islam, or the House of Islam. The Brotherhood has the dominant role in the execution of the pre-violent form of jihad in the United States. The insinuation of shariah and its adherents into America’s academic, banking and finance, government, intelligence, law enforcement and military institutions – as well as civil society more generally – is quite far advanced. The concept of “expanding the observant Muslim base” (al-Qaida al-Islamia al-Moltzema), a tactical term found in the memorandum (1991), well more than 10 years before Osama bin Laden and Ayman al-Zawahiri helped form a global coalition of 12 Islamist groups called the World Islamic Front (aka the global jihad front or al-Qaida), then declared jihad on America and Israel on Feb. 23, 1998. In fact, Zawahiri, who is the leader of al-Qaeda, was not only a member of the Brotherhood in his native Egypt but also bases his operational templates on the views of prominent Islamic theorists like al-Banna and Qutb. Many Americans, and non-Muslims for that matter, today still do not realize that the ideology of a wide spectrum of Islamic macro-groups, such as al-Shabaab, Hamas, ISIS and the World Islamic Front are all based on exactly the same aggressive goals and concepts that were summarized and endorsed in 1987 by the Muslim Brotherhood in North America. In simple terms, every Islamic group mentioned above is engaged in their own regional version of “expanding the observant Muslim base.” In Arabic, the document is a concise, densely written manifesto, distilling 1,400 years of strategy and tactics used since the time of Muhammad to advance the “global Islamic state.” The term al-Qaida (“the base,” or القاعدة in Arabic) is not the name of just another Muslim terrorist organization tied to the 9/11 attack, is also an abstract concept with a deep Islamic history behind it. 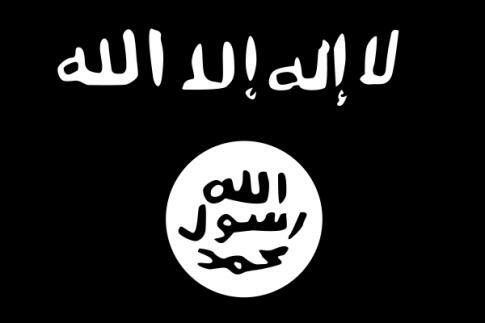 The black flag of ISIS features the “seal of Muhammad,” which goes back to the founding of Islam in A.D. 610. The Muslim Brotherhood has maintained a highly visible leading role in the global effort to “expand the observant Muslim base” since it was founded in 1928 by Hassan al-Banna in close collaboration with Sayyid Qutb, who both began attracting thousands of dedicated followers from countries all over the world. To this day, the Muslim Brotherhood remains the largest and most well-organized global Islamic organization which continues providing a solid, reliable theological and political base to fellow members in nearly every country in the world. a. Political activism- organizing Muslim Capitol Days, in Texas, in Michigan, in Missouri, in Iowa, in Florida, etc. and now spreading to Oklahoma and the rest of U.S. Boy and Girl Scouts, under terrorist front group Muslim American Society (MAS), in violation of scouting rules, are employed to make voter calls using a MAS script. i. Playing the Muslim religious card, or Islamophobia-in schools, colleges and universities, courthouses, workplaces, entertainment parks. Muslim woman plays the race card heavily against Australian police. Muslims use race card and manipulated words like “racism” (Islam is NOT a race) and “bigotry” (all Muslims are bigots who are ordered by Quran to be intolerant of, and killing all, non-Muslims) to win concession from the kafirs, and disarming their laws and Constitutions while installing Sharia Law in the process. ii. Playing the Muslim race card-in schools, colleges and universities, courthouses, workplaces, entertainment parks. Council on American Islamic Relations (CAIR), the Muslim Public Affairs Council (MPAC) , the Islamic Free Market Institute (II), and US Council of Muslim Organizations (USCMO) were later added. Historical and strategical developments of the international terror groups (Muslim Brotherhood, Hamas, Jaamat Islami), sponsored by Saudi Arabia, the world’s leading financier of terrorism worldwide.